Puree everything for the avocado dressing in a blender until smooth. Store in fridge and finish within a few days. Cook the bacon until crumbly. Put bacon aside, but keep the juices in the pan. Season the chicken with salt and pepper and cook over medium-high heat until cooked, about 4-6 minutes per side basting the chicken in the BBQ sauce as you go. Let the chicken cool a bit. Meanwhile, roast the pita croutons in the reserved BBQ oil & fats until crispy. The Bacon Double Cheese Burger Salad was better. I can't say exactly why, but something was missing from this, making it less than perfect. It might have been the chickpeas and that it would have been better with the beans instead. 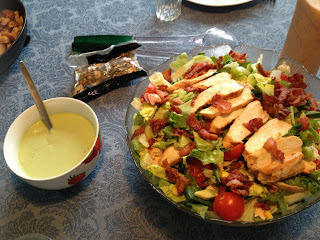 It was good enough for me to want to make it again, but not an instant favourite the way the BDCB salad was.